Computers and other devices are an important part of today’s society and digital age. These devices keep us plugged into the world, help us learn, keep us in touch with family and friends, and get work done faster and more efficiently than the days of the typewriter. That being said, there are health risks associated with too much exposure to electronic devices, including digital eye strain. Digital eye strain is a problem for anyone that continuously stares at a computer screen for a prolonged period of time. A study published in the Journal of Physical Therapy Science in 2016 reported that accelerated environmental eye fatigue is an issue for frequent users of computer screens. The researchers found that eye strain was impacted from factors like prolonged watching of visual displays, artificial or insufficient lighting, eye muscle inefficiency due to prolonged hours of office work and academic studies, aging, poor diet, and psychosocial and emotional tension. Younger and younger, people are being exposed to digital devices. Everyone everywhere is staring constantly at a screen. According to The American Optometric Association’s (AOA) 2015 American Eye-Q survey, 66% of kids have their own tablet or smartphone, and 41% of parents say their kids spend three or more hours daily on digital devices. What ways can you limit screen time, and reduce symptoms of digital eye strain? Taking care of your eyes is very important, especially for preventing long-term vision problems like cataracts and age-related macular degeneration. This article will explore digital eye strain and solutions for this ongoing problem, including how to take breaks from the screen, eye exercises, and other natural ways to improve eye health. Digital eye strain is also sometimes called eye strain, asthenopia, eye fatigue, or computer vision syndrome. It is a temporary discomfort from focusing the eyes on a digital screen for uninterrupted periods of time. 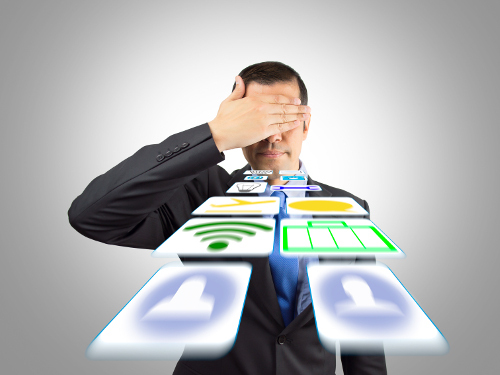 So, what are the potential causes of digital eye strain? Various electronic devices that can cause the issue include desktop and laptop computers, e-readers, tablets, TVs, gaming systems, and smartphones. Behaviors and situations that contribute to putting strain on the eyes include texting on your phone, watching TV, typing on a computer, reading on a device or computer, or playing video games. When the eyes are strained, the tiny nerves and muscles of the eyes become overworked, fatigued, and stressed. Unlike other eye conditions, digital eye strain can develop in people without a history of eye problems. It takes a lot of work to read text, make out images, and follow objects in your visual field. All day long, visual information is processed through the eyes, and this creates sensitivity to too much light exposure. Electronic or digital devices emit blue light, which is also called high-energy visible (HEV) light. It is a type of light with short wavelengths that emit a higher energy. This deep penetration may result in retina damage, sleep problems, and long-term vision problems, like age-related macular degeneration and cataracts. HEV light has also been linked to headaches, eye pain, and trouble sleeping when electronic devices are used around bedtime. What are common digital eye strain symptoms? Computer-related eye symptoms are estimated to be responsible for up to 10 million visits to the eye doctor every year in the U.S. 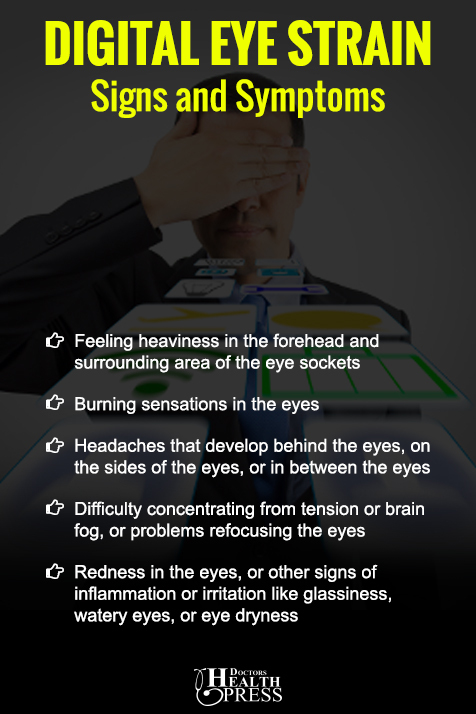 The following are possible signs that digital eye strain is a problem. Fatigue, dizziness, and neck pain are other possible symptoms from frequent time with a digital device or screen. You may also find that your symptoms decrease on days you’re spending less time focusing on the computer or some type of screen. In severe cases, blurry vision, double vision, and poor visual acuity will also occur. There are a number of natural methods to correct digital eye strain and improve eye health. Wearing glasses or contact lenses commonly helps correct vision. Also, make sure you keep up with regular eye exams at least once every two years. Your doctor may also encourage breaks from electronic devices, eye exercises, and other natural treatments for digital eye strain. The following are eight effective ways you can limit your exposure and treat digital strain symptoms. One of the best treatments for digital eye strain is taking breaks while working on a computer or looking at your phone. After all, it seems most people can’t go anywhere without looking at their devices. It is a good idea to take time throughout your day to blink and close your eyes to moisten them, and prevent dryness and irritation. Be sure to take breaks from your desk by stretching, standing up, and getting some water. It is also helpful to move around your home or workspace, take a brief walk outside, or do a short meditation or take a nap. Anything to destress for a few minutes will help to soften your gaze and regain concentration. Research shows that soothing eye exercises can help reduce symptoms of eye strain. Some effective eye exercises include palming, sideways viewing, preliminary nose tip gazing, rotational viewing, and near and distant viewing. Palming in particular will relax and revitalize the eye muscles and stimulate circulation of the aqueous humor. This is the liquid that runs between the eye lens and cornea. Glancing up and down will also help balance the lower and upper eyeball muscles. Making circles with the eyes will restore balance in the muscles that surround the eyes, and also improve coordination of the eyes. Gazing at the tip of your nose will help your focusing power of the eye muscles, and the range of motion of the eye sockets. When your body is already exhausted and sleep-deprived, the muscles in your eyes can become extra dry, tired, and painful. That is why getting between seven and nine hours of sleep is important. Keeping digital and electronic devices from the bedroom can also prevent the urge from using these devices before bed. The blue light from your smartphone or tablet can make it more difficult to get a good night’s sleep. Not having a light on while using the computer or watching TV can further strain your eyes. Putting on a light in the room can help reduce digital eye strain. Do you spend a lot of time reading off a smartphone, tablet, or computer? Instead, try listening to audiobooks or videos to give your eyes a break. Most people spend eight to nine hours reading small font from computers or papers, then they come home to continue reading from tablets and computers, or watching TV. Listening to music or videos from your phone will give the eyes an important rest. A diet high in antioxidants can help slow the progression of macular degeneration. A poor diet can also cause eye inflammation, whereas antioxidants and other key nutrients will support eye health. Many plant-based foods contain critical sources of antioxidants like vitamin A, vitamin C, vitamin E, and carotenoids. Foods high in antioxidants include carrots, squash, berries, citrus fruits, sweet potatoes, and dark leafy greens like kale, spinach, and collards. Supplementation can also protect the eyes, including a combination of antioxidants like vitamin C, vitamin E, lutein, astaxanthin, and zeaxanthin. Bilberry and omega-3 fish oil can also support eye function. Essential oils that can improve eyesight include helichrysum oil, frankincense essential oil, and cypress essential oil. It is a good idea to consult with a homeopath for the best homeopathic remedy for digital eye strain. Ruta graveolens is one of the more common remedies used for eye strain symptoms from frequent computer use. Ruta is often required from feeling stiffness in the eye muscles. Other common digital eye strain remedies include pilocarpus, physostigma, senega, arnica, conium maculatum, onosmodium, and natrum muriaticum. There are likely computers and digital devices for everyone in the world. To some degree, digital eye strain is a problem for most people, because many spend too much time on electronic devices like smartphones or tablets, as well as watching too much TV. There is a lot that can be done to reduce digital eye strain, including taking a break from your digital devices and walking in nature, getting a good night’s sleep, taking eye-protective supplements, and eating an antioxidant diet. How else can you prevent digital eye strain? Dirty screens can strain the eyes even more. It is a good rule to sit at least an arm’s length, or 25 inches away from your screen. Also, move the screen so you’re looking slightly down at it. Drinking lots of water keeps the eyes hydrated. Getting up to get a drink also gives you a reason to leave your computer. Set a timer to help you remember to look away from your screen every 20 minutes at an object about 20 feet away. Do this for a full 20 seconds. Computer glasses are a popular way to decrease digital eye strain. They look a lot like regular glasses, but they features lenses that absorb harmful blue light. These special glasses prevent the blue light from entering the cornea and causing damage to the eyes. Murphy, C., “Tips for Avoiding Computer Eye Strain,” Ground Report, October 9, 2013; http://www.groundreport.com/tips-for-avoiding-computer-eye-strain/. “What is Digital Eye Strain?” Gunnar; https://gunnar.com/what-is-digital-eye-strain/, last accessed March 17, 2017. Walsh, K., “Pros and cons of digital devices in the hands of young students,” EmergingEdTech, June 20, 2012; http://www.emergingedtech.com/2012/06/pros-and-cons-of-digital-devices-in-the-hands-of-young-students/. “Positive and Negative Impacts of Electronic Devices on Children,” We Have Kids, November 6, 2015; https://wehavekids.com/parenting/dlectronic-devices-and-gadgets-to-Children. “13 Tips to Prevent Eye Fatigue,” WebMD, September 20, 2016; http://www.webmd.com/eye-health/eye-fatigue-causes-symptoms-treatment#1, last accessed March 17, 2017. Dahl, A., “Eye Strain,” MedicineNet, May 5, 2016; http://www.medicinenet.com/eye_strain/article.htm, last accessed March 17, 2017. “Digital Fatigue: Eye Strain and Migraines,” Think About Your Eyes; http://thinkaboutyoureyes.com/articles/eye-problems-diseases/digital-fatigue, last accessed March 17, 2017. Marcin, A., “How Does the 20-20-20 Rule Prevent Eye Strain?” Healthline, February 1, 2017; http://www.healthline.com/health/eye-health/20-20-20-rule. Fischer, K., “Screen Time Hurts More Than Kids’ Eyes,” Healthline, October 12, 2015; http://www.healthline.com/health-news/screen-time-hurts-more-than-kids-eyes-101215. “Computer Vision Syndrome Eye Strain Homeopathic Treatment,” Dr. Makkar Family Clinic; http://www.askdrmakkar.com/computer_vision_syndrome_eye_strain_homeopathic_treatment.aspx, last accessed March 17, 2017. Kim, S.D., et al. “Effects of yogic eye exercises on eye fatigue in undergraduate nursing students,” Journal of Physical Therapy Science, June 2016; 28(6): 1813-1815, doi: 10.1589/jpts.28.1813. “What is Blue Light?” The Vision Council; https://www.thevisioncouncil.org/content/blue-light-exposure-and-digital-eye-strain, last accessed March 17, 2017.